Editor’s Note: Wild turkeys have their own vocabulary. 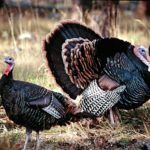 Although scientists and hunters attempt to explain the vocabulary of the wild turkey, their statements and conclusions may be contradictory. Not until someone teaches a turkey to speak English will we find out exactly what each sound means. But here’s an explanation of the sounds turkey make and how and when to use them. * Gobble – When a turkey gobbles, he’s telling the hens where he’s located and that he wants them to come to him to be bred. He’s also exerting his dominance. 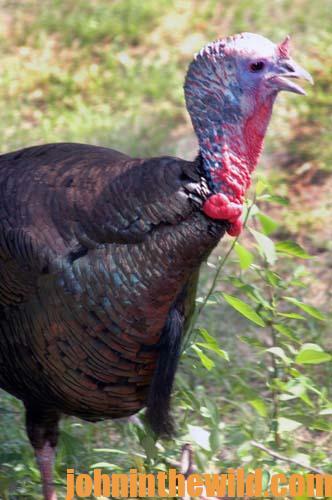 Usually when a boss or a dominant tom gobbles, the subordinate gobblers in the area will quit gobbling. Since he’s the dominant bird, he claims the right to breed all the hens and seems to be reminding the subordinate toms to stay clear. A gobble also can be a challenge to other toms. It’s almost an open invitation to a battle of spurs, beaks and wings. 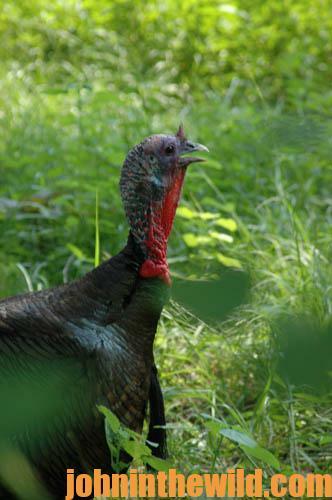 * Young Gobbler’s Squealing Call – Often called the kee-kee run, this call is made by a young gobbler before his voice is fully developed. A bird making a kee-kee run sounds much like a teenage boy whose voice cracks. Sometimes he talks low like a man and at other times high like a boy. A young gobbler’s squealing call, which is usually a high-pitched whistle followed by a series of coarse yelps, is effective in the fall. This call is the one young gobblers often use to find their mothers or locate each other. * Gobbler Yelp – Often, especially in the fall, gobblers will give coarse yelps that are heard when there’s a flock traveling together. The gobbler yelp is generally used by the birds to locate each other. However, this call also can be heard in the spring. * Cluck – When a gobbler comes-in to meet a hen, sometimes he’ll come in clucking to let the hen know his location. * Putt – When a gobbler putts, the hunt’s over. The putt means that he’s preparing to shift into high gear and leave the area. When you hear a turkey putt, get ready to shoot, or change locations. * Drum – If you’ve ever heard an 18-wheel truck tackle a steep grade and shift gears, then you know what a turkey’s drumming, sounds like. Drumming is a low, quiet sound gobblers make to let hens know their locations. Many times when a turkey is coming to your call, you will hear the drumming sound long before you see the turkey. Turkeys most often drum when they strut, and the drumming sound usually will be heard along with the sound of the turkey’s wing tips dragging across the leaves and dirt. Gobbler calls are the most dangerous to employ, because these are the sounds that attract other hunters. Be careful! 1) Have your back against a tree, and watch for other hunters before you gobble. 2) Realize that if you gobble there’s a good chance that you may run-off the turkey you’re trying to call. 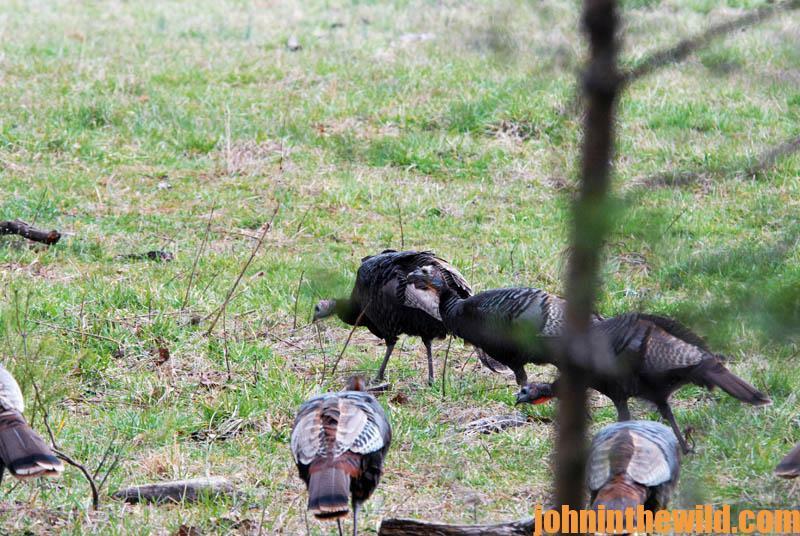 If the tom’s not the dominant gobbler, he may leave rather than come into what he believes will be a fight. However, if the turkey is a dominant bird, the tom may think that another gobbler has moved into his territory and come-in ready to fight. 3) Use the gobble call as a last resort. * Young Gobbler’s Squealing Call: The squeal is usually three, high-pitched calls followed by a series of yelps. You can make it on the diaphragm call by pushing your tongue into the diaphragm, so that the rubber is stretched to give the high squeal. Then loosen the pressure on the diaphragm to give a series of yelps. A young gobbler’s squealing call can be productive during the fall after the turkeys have scattered. Sometimes this call is successful in the spring. * Yelp: The gobbler’s yelp, which is seldom heard, is a coarse form of yelping. Generally, the yelp will be made by young gobblers. To make this sound, most hunters prefer using a coarser box call or the opposite side that produces hen calls. A triple reed or a split reed diaphragm call will also work. 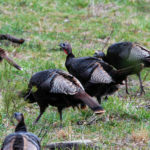 The gobbler yelp often will bring a gobbler to the gun during the fall and winter months when large flocks roam together. * Cluck: The cluck is a good call to use in the fall. Usually the gobbler cluck is more coarse and deeper than the hen cluck. * Putt: Already described under hen calls, the only time to use the tom putt is when you’re attempting to break a gobbler out of a strut. * Drum: This call is made by the turkey and rarely, if ever, is made by a hunter. 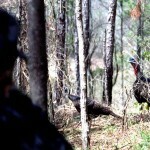 The best way to approach the use of calls is to understand that a turkey hunt is like a chess game. Although there are certain moves that the players learn to play the game, the real masters of the sport often break the rules to produce better results. Here are several standard plays in general calling situations. * Scenario One: You go into the woods a little before daylight and hear a turkey gobble. You slip into an area where you can see 30 to 40 yards in all directions and face the direction from which you expect the turkey to come. You give a soft tree call. The turkey gobbles back. In a few minutes, you hear the turkey fly-down from the roost and gobble as he hits the ground. Now you give a few light yelps. The tom gobbles again and moves closer. In a matter of minutes, the turkey appears and walks straight toward you. Your shotgun rests on your knee and is pointed at the turkey. When the bird is at 30 yards, you squeeze the trigger. Bang! The hunt’s over. 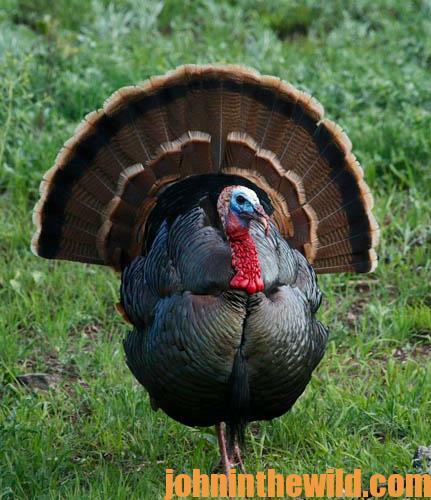 * Scenario Two: You hear a tom fly-down from the roost and gobble as he hits the ground. You give a few light yelps. The tom gobbles back but doesn’t move closer. Although you cluck and yelp, the bird keeps his distance. You begin cutting to the bird. Hearing the call, the turkey comes in. Bang! The hunt has ended. * Scenario Three: The gobbler flies-down from the roost, gobbles and moves toward you. Then he stops just 50-yards away, strutting and drumming, but not coming close enough for a shot. You make some soft clucks. Although the tom moves closer, he stops again at 40 yards, once more strutting, drumming and refusing to come closer. You give some light purrs that sound like a contented hen. The turkey moves closer. Bang! The hunt’s over. * Scenario Four: The gobbler flies-down and comes in but hangs-up at 50 yards. Although you try all the tactics in Scenario Three, none work. Using the mouth-diaphragm call, you direct your call to tree 10 yards behind you. The tom thinks the hen is walking-away from him and moves closer. Bang! The hunt has ended. * Scenario Five: Same situation. You use all the above tactics but none work. The gobbler is still hung up at 50 yards and refuses to move. You let the tom walk-off. When the bird is well out of sight, you circle to the right of the bird, take another stand, change calls, and try again. This time the gobbler walks right in. Bang! You’ve had a successful hunt. * Scenario Six: The tom flies-down, gobbles and walks-away. You follow the turkey and call occasionally – sometimes yelping loudly. Finally, the gobbler stops and comes back to you. Bang! The hunt is over. * Scenario Seven: The turkey gobbles from the roost, but because he’s in an area where he’s been hunted heavily, he won’t come to any call at first light. You leave the woods, return to the area around 10:00 am and take a stand. You give some light clucks and yelps. The turkey comes to you silently, never gobbling. Bang! The hunt has ended successfully. These scenarios are just a few that may occur when a hunter takes his calls and goes into the woods to pit his skills against the master of the woods. Although knowing when to call and what calls to give are important, understanding where a turkey wants to go and why will result in more birds being bagged. Also important to successfully bagging gobblers is learning when not to call and how not to overcall. Put bluntly, one of the biggest problems novice turkey hunters face is knowing when to shut-up. 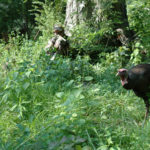 Turkey calls have been designed to make gobblers come to turkey hunters, not to be used as conversational tools to allow sportsmen to continuously talk to birds. As soon as a hunter determines that a tom is moving toward him, the most-effective call he can use is no call at all.